The 2015 Nobel prize for economics has been awarded to Angus Deaton, who is based in the Princeton University, in USA. Deaton’s work has been on poverty and his contemporaries in the field are Amartya Sen and Jean Dreze; all three have focused on poverty, malnutrition, consumption by households and how to measure these. 1 – like every single Nobel award category, the one for economics is calculated recognition of the use of Western ideas. 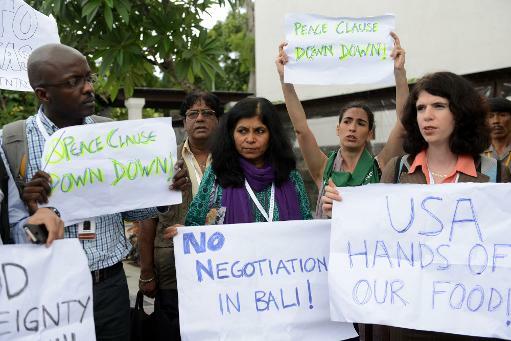 2 – There is no Nobel in economics for, say, Pacific islander economics or nomadic/pastoral economics. The boundary is clear. 3 – There is the additional problem, and it is a weighty one, of what is being recognised: a science or a thought experiment? 4 – Western economics can only ever and at best pretend to be a science (ignore the silly equations). There’s more. 5 – It has to do with food and food consumption choices. Do remember that. For the last 5-6 years the food MNCs and their..
6 – collaborators in Bharat have moved from hunger to nutrition. Remember that we grow enough food for all our households..
7 – and there are in 2016 about 175 million rural and 83 million urban households. So, food is there but choice is not yet..
8 – as clear as the marketeers and retailers pretend. No one truly knows, but economists claim to, and this one does. 9 – What then follows is the academic deification of the thought experiment, done carefully over a decade. The defenders..
10 – of the postulations of Deaton, Dreze, Sen et al turn this into a handmaiden of poverty study. And India is poor..
11 – (but Bharat is not). So we now have consumer choice, poverty, malnutrition and a unified theory to bridge the mess..
13 – was thus set some years ago, when the Congress/UPA strove abundantly to craft a halo for this thought experiment..
14 – and in the process, all other explanations concerning food and the manner of its many uses were banished from both..
15 – policy and the academic trend of the day. But Deaton’s experiment is only as good as his references, which aren’t..
16 – for the references, as any kirana shop owner and any mandi bania knows, are more unreliable than reliable. What our..
17 – primary crop quantities are have only ever been a best estimate subject to abundant caution and local interpretation..
18 – for a thought experiment which seeks to unify food, malnutrition, poverty and ‘development’ this one has clay feet..
19 – which nevertheless is good enough for the lords of food crop and seed of the world, for it takes only the shimmer of..
20 – academic respectability such as that accumulated by Deaton, Dreze and Sen to turn postulate into programme. What we..
21 – will now see is what has been seen in medicine (and therefore public health) and in ‘peace’ (hence geopolitics) because..
22 – of the benediction the Nobel aura confers. This work will be press-ganged into the service of the new nutritionists..
23 – whose numbers are growing more rapidly than, a generation ago, did the numbers of the poverty experts. It is no longer..
24 – food and hunger and malnutrition but consumer choice, nutrition and the illusions of welfare. This is the masala mix..
25 – seized upon by those who direct the Nobel committee as they seek to control our 105 million tons of rice, 95 of wheat..
26 – our 43 million tons of coarse cereals, 20 of pulses, 170 of vegetables and 85 of fruit and turn this primary wealth..
27 – of our Bharat into a finance-capital manifesto outfitted with Nobel armoury that is intended to strip choice (not to..
28 – support it) from our kisans who labour on the 138 million farm holdings of our country (85% of them small and marginal)..
29 – and from our 258 million households (as they will be next year) towards whose thalis is destined the biofortified and..
30 – genetically modified menace of hyper-processed primary crop that is digitally retailed and cunningly marketed. This..
31 – is the deft and cunning manoeuvring that has picked on the microeconomist of post-poverty food study aka nutrition..
32 – as being deserving of Nobel recognition (when five years ago the Nobel family dissociated itself from this category). 33 – And so the coast has been duly cleared. The troublesome detritus of poverty macro-economics has been replaced by the..
34 – big data-friendliness of a rickety thought experiment which lends itself admirably to a high-fashion ‘development’..
35 – industry that basks in ‘sustainable’ hues and reflects the technology-finance tendencies of the SDGs. Food is no longer..
37 – economics is all aflutter again, thanks to the Nobel wind of 2015, but I will not allow it to fly over my Bharat. Never. PS: The Western media has as usual waxed cluelessly eloquent on the selection of the award winner. This is the new York Times writing itself breathless about what this means for understanding the situation of the poor in the global economy. There is an account from Princeton [pdf] on the measuring of poverty, which has now become such a burgeoning industry. The statement of the committee which awarded this economist is here, with a more detailed version here [pdf]. The alarming tale of food prices, from 2004 January to 2013 August, that have squeezed the household budgets of cultivators and rural labourers. For most of 2013, the central government broadcast, through important cabinet ministers and official statements, its worry about economic growth, that every effort must be made to steer India back towards a high economic growth rate. In the food and agriculture sector, that effort has led, in the last four to five years, to a gulf in growth rates between agriculture and the combination of processed and packaged foods and beverages (which the food retail industry is being arrayed around). While the agriculture sector (including fisheries and livestock) has been growing at or just above 4% a year for the last several years, the processed foods and beverages industry has been growing at around 15% a year. The effects of this growth (setting aside criticisms of how such growth is measured) in both these allied sectors – the one much larger but the other which is a feature of urbanising India – may be seen in the transformation of cultivation and of food. That is why, not only has the consumer price index for rural citizens climbed without let every year for the last nine years, there is evidence in this index data to show that the rate of increase has accelerated in the last few years. The trend we have all become painfully familiar with, in states and towns measured and unmeasured. 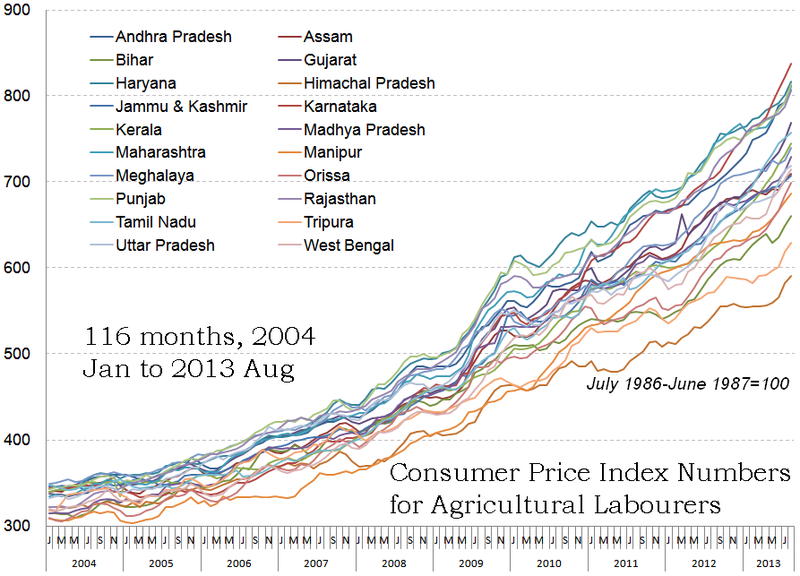 The consumer price index for agricultural labourers (usually abbreviated to CPI-AL) from 2004 January to 2013 August shows a steady rise for all the 20 states in the set (see the chart alongside). Compiled by the Labour Bureau, Ministry of Labour and Employment, the data shows that the average CPI-AL of these states has been rising around 50 percentage points a year for the last four years. Using quarterly averages (taken for June, July and August) for 2013, 2012 and 2011 and comparing them with the same averages a year earlier, we see that the all-India increases in the index for 12 months (2013 over 2012) is 12.96%, for 24 months (2013 over 2011) is 22.68% and for 36 months (2013 over 2010) it is 34.08%. 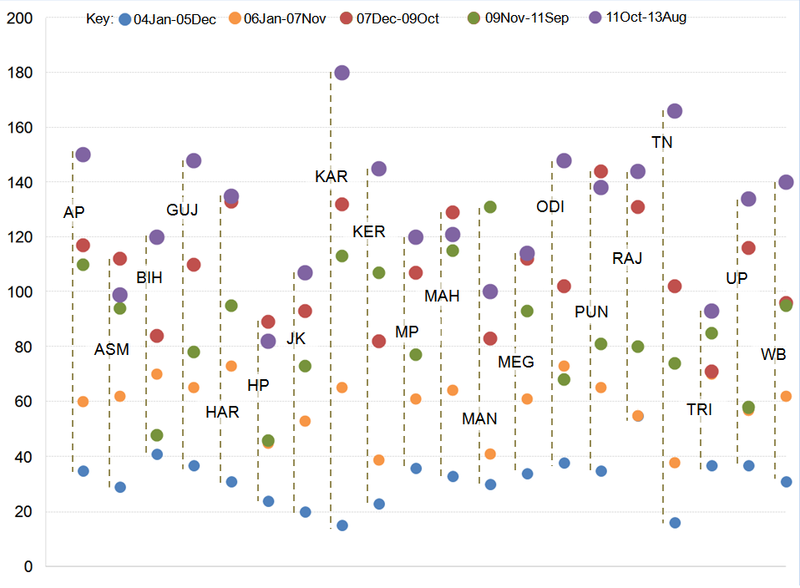 States that experienced the steepest increase in the CPI-AL over 36 months are Gujarat with 32%, Punjab 32.4%, Odisha 32.5%, Rajasthan 35.1%, Maharashtra 35.3%, Manipur 37.6%, Andhra Pradesh 37.9%, Kerala 38.4%, Tamil Nadu 39.2% and Karnataka 48.2%. That is why we have witnessed the widespread trend of migration by rural populations towards smaller urban agglomerations, with the impacts recorded in various data releases from Census 2011. The Labour Bureau data contains evidence that for all states which have CPI-AL measured, the rate at which the index is rising is accelerating. This acceleration is visible when the period 2004 January to 2013 August is divided into five phases. These are represented by the circles in the illustrated chart (the main image above), the phases 2004 Jan to 2005 Dec, 2006 Jan to 2007 Nov, 2007 Dec to 2009 Oct, 2009 Nov to 2011 Sep and 2011 Oct to 2013 Aug). These points (five for each state) are plotted against not the ordinary scale of the CPI-AL but against a range of point increases in the CPI-AL. Hence this shows the rise in the CPI-AL and the more recent speed of that rise. Foreign direct investment (FDI) has been rolling into India at a steady pace, whether in banking and finance,whether in insurance (general insurance and health), pharmaceuticals, automobiles (particularly automobiles), information technology, food and beverages (very much so), and engineering and manufacturing. And then there is retail, which has so incensed all those who have firmly believed that India and Bharat need none of this and that the swadeshi and swarajya of the Independence movement are, 66 years on, needed even more than they were in the 1920s and 1930s. And I count myself amongst those so incensed. It comes as a surprise then to read about the ‘brake on the economy’ that low-level corruption is in India, as a recent Reuters report has put it. The report is well done, and is right to probe the methods of corrupt underlings, but I find it bordering on the absurd that these practices – in short, hand over the moolah for the licence you want – are treated as hindering India’s ‘growth story’ (as the country’s finance minister monotonously calls it, ignoring the ecological idiocy of desiring more growth, unmindful of the millions of new deprivations his story has no place for). This breathlessness, well captured by Reuters, is part of P Chidambaram’s favourite fairy tale. 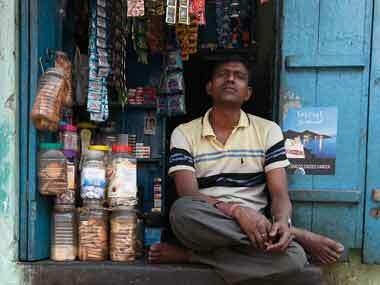 But of course, real life in curbside India is full of smoke and mirrors. Reuters said that a “daunting array of permits – more than 40 are required for a typical supermarket selling a range of products – force retailers to pay so-called ‘speed money’ through middlemen or local partners to set up shop”. 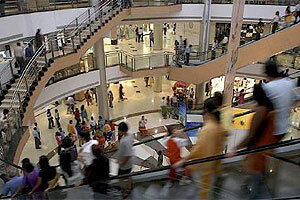 Speed money is a colourful term, and suited to the technicolour life and times of the retail business in India. Reuters sounds prudish when it reported, citing interviews with middlemen and several retailers, that the “official cost for key licenses is typically accompanied by significant expenses in the form of bribes”. The added cost, said Reuters, erodes profitability in an industry where margins tend to be razor-thin, and “creates risk for companies by making them complicit in activity that, while commonplace in India and other emerging markets, is nonetheless illegal”. Commonplace and illegal as much as underpaying workers in the USA, I presume, which is what the retail capitalists do. See this report about workers at McDonald’s, Wendy’s, Yum! Brands, Burger King, Domino’s Pizza and Papa John’s going on strike in New York City demanding wages that are twice the current $7.50 an hour, which is described as impossible to live on. As for Walmart, it’s rankly exploitative imprisoning of its workers, paying them just above minimum wage but denying them freedom of association (the USA is a member state of the ILO, the International Labour Organisation) and medieval working conditions can hardly, in any country, make it a paragon or corporate virtue. But the Reuters report, useful as it is in explaining the very broad-based and low-level graft that layers our cities like a fog, cannot venture into the area of the demands of international finance capital led neo-liberalisation. This seeks to prise open our economy – aided eagerly by the astoundingly greedy political class in India (Delhi, Bombay, Bangalore, Hyderabad, Ahmedabad, Calcutta and every other large city) – for profit maximisation. Never mind the few bleating complaints about streetfront corruption repeated by Reuters, there is optimism aplenty amongst financiers, business people, bankers, commodity brokers, the realty sector, the automobile and FMCG sectors, all fed by the fact that the United Progressive Alliance government of India is more than willing to bend, break and jettison wholesale regulations that favour the proletariat in order to satisfy international capital and Indian big business. Only last December (2012) both the houses of Parliament in India were told that there would be an inquiry following media reports concerning the submission made by the global retail giant Walmart to the US senate that it had spent around Rs 125 crore (Rs 1.25 billion or about US$23.2 million) during the last four years on its lobbying activities, including the issues related to “enhance market access for investment in India”. Now, really, what’s a bit of ‘speed money’ compared to a sum like that? Or compared to the US$100 million (about Rs 455 crore) that Walmart is reported to have funnelled into India (to its Indian partner Bharti Enterprises) and at a time when multi-brand retail was not permitted? 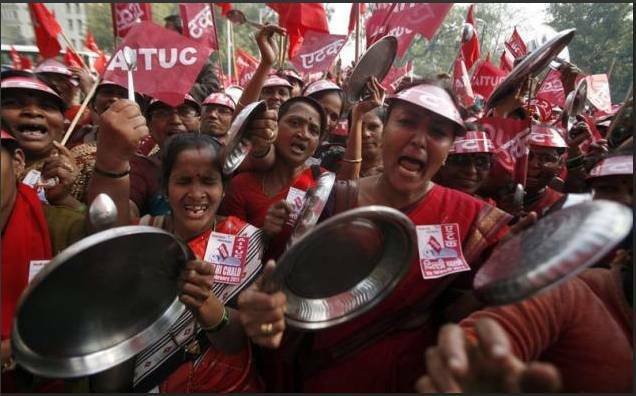 Update – The real nature of the neoliberal economy of India has become clearer with the decision – against the run of public opinion and against the evidence from the agricultural and food sectors – to permit opening up the retail sector. Since the decision was taken, the central government has spared no effort in a cynical and devious campaign to claim that permitting foreign direct investment in retail will benefit farmers and consumers. On Sunday, 27 November 2011, large advertisements were released in newspapers proclaiming the benefits of this decision. Nothing is further from the truth. India’s urban households, those eking out livelihoods from informal work and precarious manufacturing sector jobs, recognise the untruth and see the evidence in the 10%-15% annual food inflation. Our trade unions know this and our left parties know this. Ranged against this population, rural and urban, are the ministries and industries who see in the permission a new means to control access to food and the provisioning of food. That is why I support the opposition represented by the Communist Party of India (Marxist), whose concerns reflect those of this broad majority. India’s central ministries – now even further disrobed to reveal their predatory nature as instruments of the country’s business satraps – have held up the flimsy excuse that conditions imposed will safeguard the farmer, consumer and small retailer. This is lies. The restriction that foreign retail outlets are limited to operating in cities of over 1 million population is meaningless because those are precisely the places where the MNCs want to go, to tap the lucrative segment of the market. It is in these cities – there are 53 cities with populations of over a million – that small retailers are mostly concentrated. India has the highest shopping density in the world, with 11 shops per 1,000 persons – these have evolved as neighbourhood suppliers and represent a cultural integration of small supplier and household familiarity. The result is a rich density of trusted small retail – India has over 12 million such shops and these employ directly over 40 million persons. Well over 95% of these shops are run by self-employed persons in floor areas of under 500 square feet (about 48 square metres). It is these small shopkeepers in urban areas who fear for their future with the now-sanctioned entry of the MNC retailers. 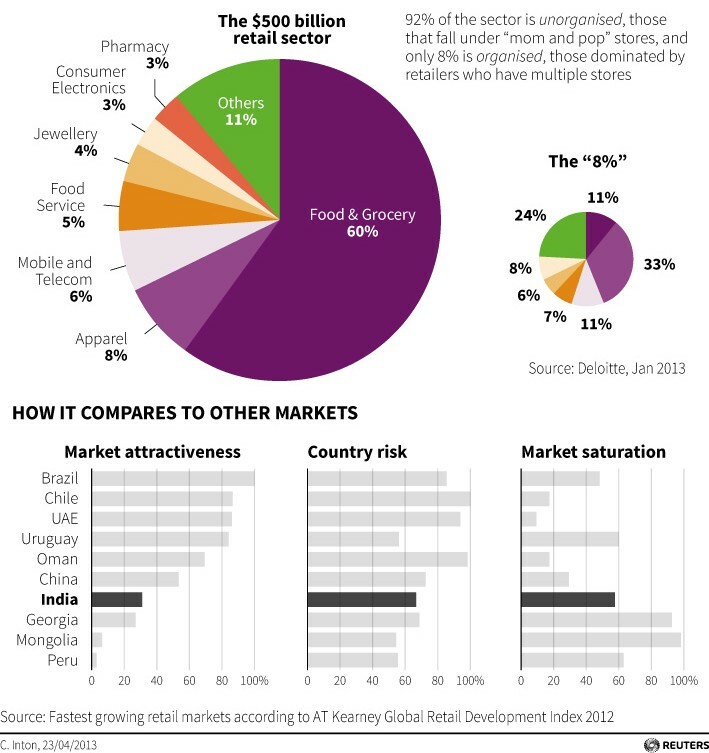 International experience shows that supermarkets everywhere invariably displace small retailers. Small retail has been virtually wiped out in the developed countries like the US and Europe. South East Asian countries had to also impose stringent zoning and licensing regulations in order to restrict the growth of supermarkets, after small retailers were getting displaced. Then there is the cunning untruth that the condition for making at least 50% of the investment in ‘backend’ infrastructure will benefit rural populations, as this is said to lead to more cold chains and other logistics, benefiting the farmers. International experience has, however, shown that procurement by MNC retailers do not benefit the small farmers – we have seen this in India despite the specious and manufactured ‘case studies’ produced by India’s management schools (the several worthless and compradorist Indian Institutes of Management and their similarly worthless competitors). Over time, smallholder farmers receive depressed prices and find it difficult to meet the arbitrary quality standards. Allowing procurement by MNCs will also allow the central government to reduce its own procurement responsibilities, and this will directly affect the food security of those millions of rural and urban households which depend India’s public food distribution system. 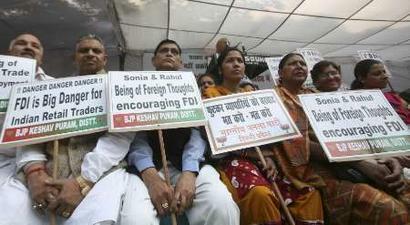 2011/11/25 – This is a turning point for India’s economy. The central government has allowed foreign investment up to 51% in the retail sector for ‘multi-brand’ ventures, and has allowed 100% foreign investment for single brand retailers. With this permission, the ruling United Progressive Alliance has ignored utterly the concerns of hundreds of representations made over the last year by small traders and wholesalers, and by grocery shops’ assocations all over India, against the entre of foreign direct invetment in the retail sector. 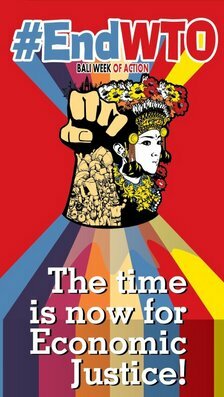 The ruling United Progressive Alliance has also ignored the needs and conditions of hundreds of thousands of smallholder farming families, who will from now on be steadily exposed to increasing levels of coercion to submit to corporate and industrial farming pressures, or to quit cultivation and join the masses of informal labour in urbanising towns and cities. India’s powerful business and indutries associations – the Confederation of Indian Industry (CII), the Federation of Indian Chambers of Commerce and Industry (FICCI) and the Associated Chambers of Commerce and Industry of India (ASSOCHAM) – have vigorously for the last two years been manoeuvring the ruling political alliance towards this position. They have been aided substantially by representations from the countries and regions who have the most to gain from this permission being given – the USA and the European Union. The so-called economists and analysts who are regularly polled by the business media and whose pronouncements are used to justify the progression of policy towards such permission, are making a variety of claims about the effects the expected foreign investment will have on India. They are saying that this “much delayed reform” will help unclog supply bottlenecks and help ease food inflation, that it will benefit farmers who can get better prices for their produce and will bring in international expertise to streamline supply chains in India. This is rubbish meant to distract. The big retail corporations have for years been demanding entry into a country which is estimated to have a retail sector whose annual sales are said to be around US$450 billion. But this is a sector populated by tens of thousands of tiny family-run shops that account for 90% of this enormous volume of sales. This is a turning point for India’s economy, for it signals the start of yet another struggle to first block, and then throw out the retail conglomerates. 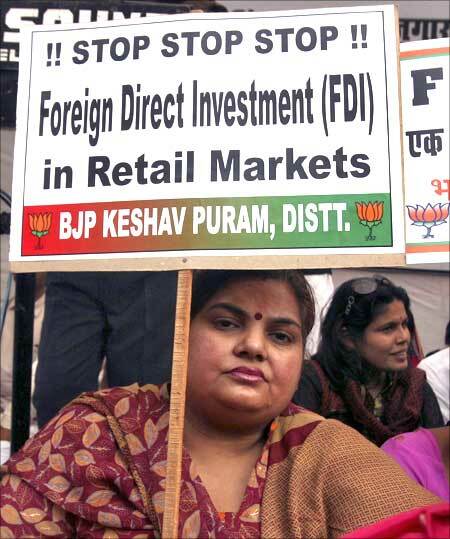 IBNLive – ‘FDI in retail cleared; multi brand 50 pc, single brand 100 pc’ – The Union Cabinet FDI in multi-brand retail and single brand retail despite division within the UPA on the issue. 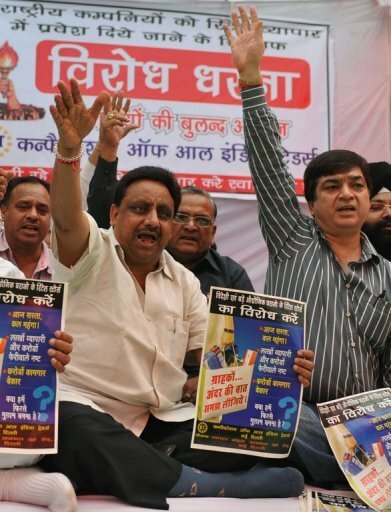 This permission, given by a ruling political coalition that has allowed food inflation to rage on unchecked for the last three years, which has regularly pushed up the prices of petrol (gasoline) and diesel, and whose record on tackling corruption and graft is shamefully weak, will not go unchallenged. 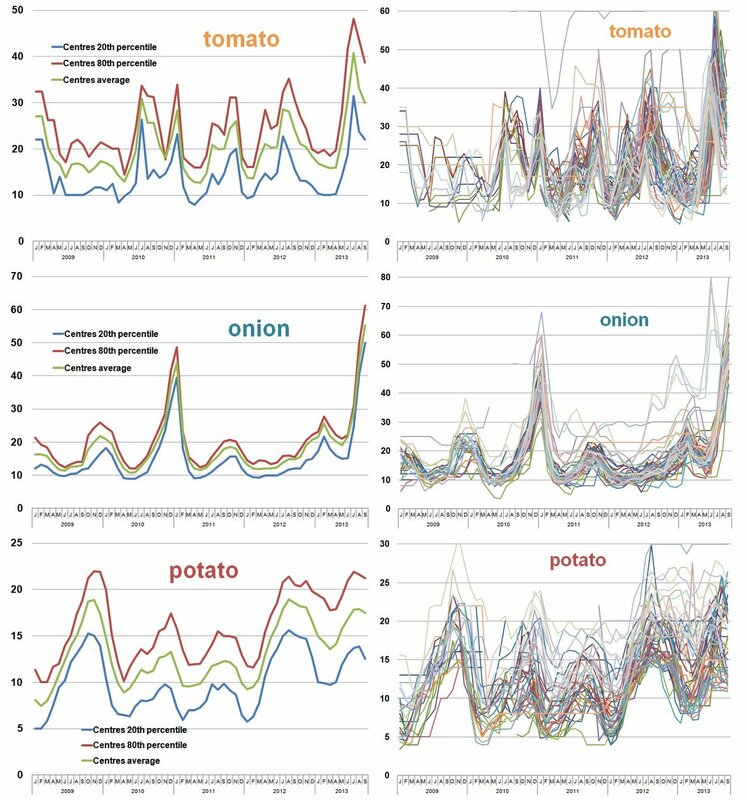 The alternative economics webcentre MacroScan has published my article on food waste/loss, food flows and food processing in India. Good job by FAO on this topic, an extremely important one. 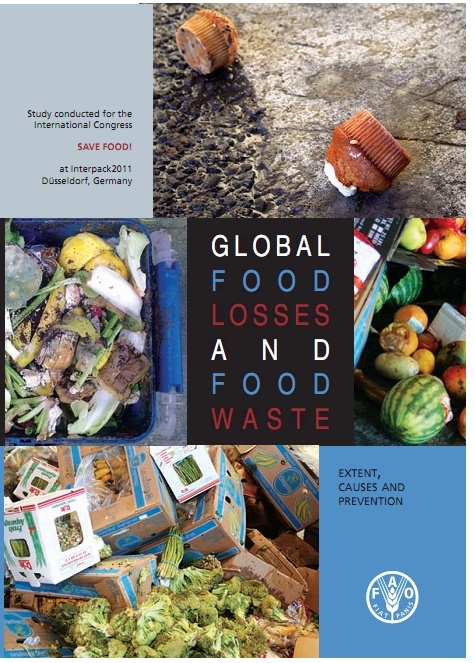 ‘Global food losses and food waste’ is the title of a new report by FAO and it is an eye opener indeed. 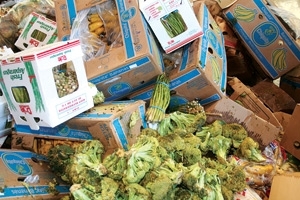 FAO has said that food waste is “more a problem in industrialised countries, most often caused by both retailers and consumers throwing perfectly edible foodstuffs into the trash”. This is true, but only partly. It is in fact a problem of societies that have industrialised their food handling, processing and retailing systems to the average level that is seen in the OECD economies, and that this problem is therefore as much visible in the urban food consumer markets of say Sao Paulo and Mumbai and Jakarta as it is in North American or west European cities and towns. The study has shown that per capita waste by consumers is between 95-115 kg a year in Europe and North America, while consumers in sub-Saharan Africa and South and Southeast Asia each throw away only 6-11 kg a year. The ‘only’ is relative of course. If these averages are mapped to populations and their food wasting habits, then for Bangladesh in 2011 we have a total wastage of 1.275 million tons! 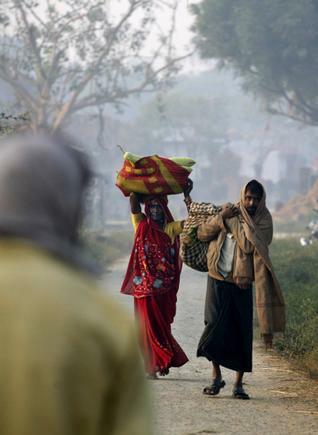 What was the total harvest of vegetables in Bangladesh in 2008? It was 1.1 million tons (FAOstat)! Total per capita food production for human consumption is about 900 kg a year in rich countries, almost twice the 460 kg a year produced in the poorest regions. 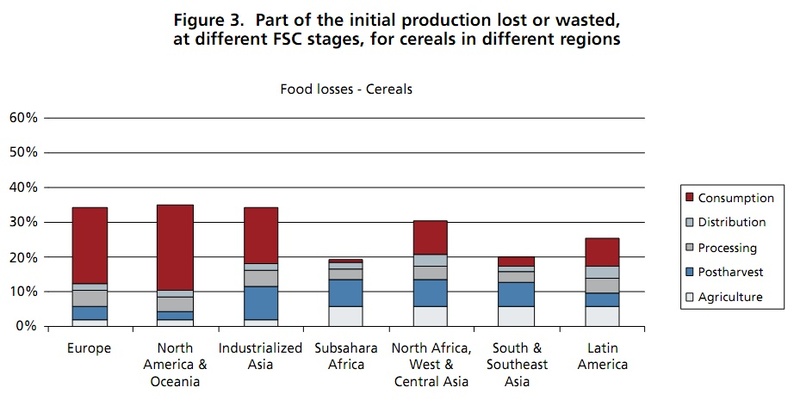 In developing countries 40% of losses occur at post-harvest and processing levels while in industrialised countries more than 40% of losses happen at retail and consumer levels. Food losses during harvest and in storage translate into lost income for small farmers and into higher prices for poor consumers, said the report. Reducing losses could therefore have an “immediate and significant” impact on their livelihoods and food security. There are wider connections between food loss + waste and natural resources and energy. Food loss and waste also amount to a major squandering of resources, including water, land, energy, labour and capital and needlessly produce greenhouse gas emissions, contributing to global warming and climate change. What can be done? For a start, selling farm produce closer to consumers, without having to conform to the quality standards of retail markets, is a good suggestion. “This could be achieved through farmers’ markets and farm shops” said the report, which is in fact one of the strengths of the Transition movement in the West. The real problem lies in the retail labyrinth in urban areas, particularly in fast-industrialising Asia. Here, in rather myopic copycat fashion without any learning having taken place, food is wasted due to quality standards that over-emphasise appearance. My guess is that this report will not have reliability of the kind it ought to for India and China, simply because in Asian cities and towns, a large network of scrap vendors (for food too) exists which will place food rejected by the retail markets into channels used by the urban poor, by small roadside eateries and by micro-businesses in the informal food processing industry. What the study is cler about is that “consumers in rich countries are generally encouraged to buy more food than they need”. The ‘Buy three, pay for two’ promotions are one example, while the oversized ready-to-eat meals produced by the food industry are another. Restaurants frequently offer fixed-price buffets that spur customers to heap their plates. Generally speaking, consumers fail to plan their food purchases properly, the report found. That means they often throw food away when “best-before” dates expired. There are some useful numbers in here. The study has shown that the per capita food loss in Europe and North-America is 280-300 kg per year. In Sub-Saharan Africa and South and Southeast Asia it is 120-170 kg per year. The total per capita production of edible parts of food for human consumption is, in Europe and North-America, about 900 kg per year and, in sub-Saharan Africa and South and Southeast Asia, 460 kg per year. 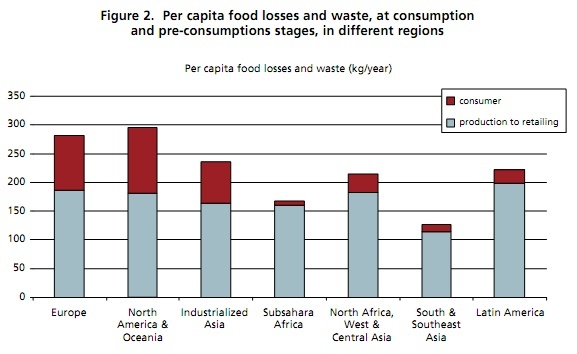 Per capita food wasted by consumers in Europe and North-America is 95-115 kg per year, while this figure in sub-Saharan Africa and South and Southeast Asia is 6-11 kg per year. Food waste at consumer level in industrialised countries (222 million tons) is almost as high as the total net food production in sub-Saharan Africa (230 million tons). India’s economy planners when discussing agriculture are no closer to farm and field realities. 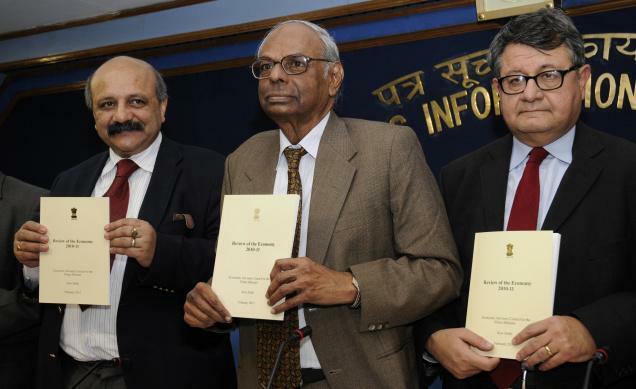 That much is clear from a reading of the ‘Review of The Indian Economy 2010-11’, by the Economic Advisory Council to the Prime Minister, released to the public on 2011 February 22. The document had, I suspect, been finalised and was waiting for the data from the Second Advance Estimates of agricultural production for the 2010-11 year. A cursory analysis of this forms the ‘Agriculture’ section of the ‘Review’ [read the relevant portions of the Review here]. * “As against the target of average 4 per cent growth during the Eleventh Plan period, the actual average growth is likely to be slightly less than 3 per cent.” Which only indicates that ‘growth’ in the agricultural sector will continue to be seen as a primary consideration, outweighing the sustainable use of natural resources management. The growth insistence will also mean the continued support of high-input and financially burdensome agricultural methods. * “Somewhat in parallel, the per capita availability in grams per day has also not gone up in a context where per capita income has been rising quite strongly.” The Economic Advisory Council has not been honest enough to draw the needed connections – between population growth and therefore foodgrain demand, and the need for urgently revisiting the basis for planning agricultural cultivation at the district level. * “The international prices for grain have been very volatile and much elevated in recent times and therefore higher levels of domestic output is an even more important factor to consider in the context of domestic food security.” This is spot on. Why doesn’t the rest of the Concluding remarks section build on this? * “Attention must be focused on building rural infrastructure, developing technologies that are appropriate to the region which have to be disseminated – delivered in an efficient fashion. The institutions that are enjoined with this task have to be activated in a more energetic fashion.” The Concluding Remarks does not build on the above point because of such weak, vague and misguided points as this one. ‘Technologies’ and ‘Infrastructure’ for growth at 4%? Or for food security? * “The liberalization of the economy has benefited the farm sector and as a result the terms of trade for agriculture are no longer adverse.” This is one of the Big Contradictions of the Review. No, the liberalisation of the economy has NOT benefited the farm sector. Has the Government of India and its economic planners so quickly and so completely forgotten that 200,000 farmers have committed suicide over the last decade? * “Investment in the farm sector has also picked up substantially and capital formation as a percentage of agricultural GDP has more than doubled in the past decade.” To what end? To achieve the 4% growth target which is denominated in ‘technology’ and ‘infrastructure’ in the agri sector? Has there been even 2% annual growth in the incomes of the cultivating households? * “There seems to be evidence that better quality seeds and superior cultural practices are available, but the delivery system for translating these to the field are lagging.” This is where the threat in the Review lies. What delivery systems and who owns them? * “A major hurdle in agricultural development is the inefficiency of the delivery systems. There is a plethora of institutions in research, extension, credit and marketing. However, efficacy of these institutions to deliver goods and services to the country’s vast small and marginal farms section is quite limited. This is a serious cause for concern.” True. How to support this point and rescue it from the overall contradictions of the Concluding Remarks? * “There is need therefore, to attune these various institutions to the emerging agrarian structure, which is progressively identified with the small and marginal farmers.” True. * “A two-fold strategy is indicated for this purpose. 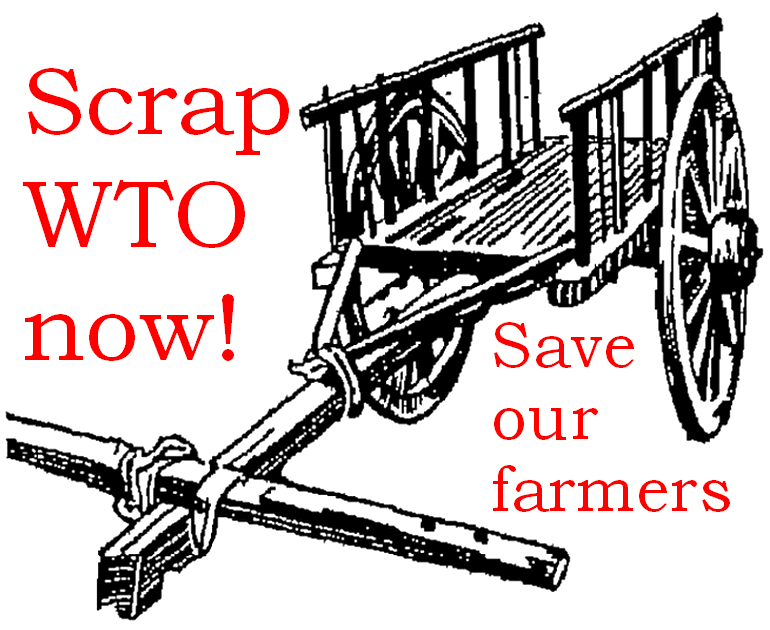 One, to encourage farmer’s collaborative efforts as in cooperatives, or more recently in producers companies, and vertical integration of production and marketing by suitable models of contract farming.” Emphatically NO. This is not the answer. * “Two, at the institutional level, the organizational changes to cut down the cost of transactions (e.g. through a flexible and inclusive business correspondent model) and the use of information technology for the same purpose needs to be encouraged.” True with reservations. Infotech is a means and not an end. * “In addition both for purposes of ensuring remunerative prices for farmers as well as an anti-inflationary measure, the strengthening of organized retail, as well as use of these outlets for public distribution along with the strengthening of the existing public distribution networks, are measures that need to be tried out seriously.” This is dreadfully ill-advised and apparently motivated by the FDI-seeking stand of the central government. This point of view must be stopped immediately. Dozens of farmers’ cooperatives and small traders have clearly and vociferously rejected FDI-driven organised retail in India. This point holds the back door open for the entry of corporate retail and will be used to legitimise retail control over access to food to vulnerable rural populations. * “Local procurement by State Government agencies provides an incentive for farmers to grow grain. Coarse cereals are a varied commodity and tastes differ across States. There is also a problem in handling coarse grains.” Yes, yes and no. This point must be supported and rescued from the other corporate-oriented directions of the Review. Advisory Council to the Prime Minister, released to the public on 2011 February 22.
the ‘Agriculture’ section of the ‘Review’ (read the relevant portions of the Review here). continued support of high-input agricultural methods. cultivation at the district level. here. ‘Technologies’ and ‘Infrastructure’ for growth at 4%? Or for food security? committed suicide over the last decade? sector? Has there been even 2% annual growth in the incomes of the cultivating households? threat lies. What delivery systems and who owns them? from the overall contradictions of the Concluding Remarks? which is progressively identified with the small and marginal farmers.” True. means and not an end. the entry of corporate retail. the other corporate-oriented directions of the Review.